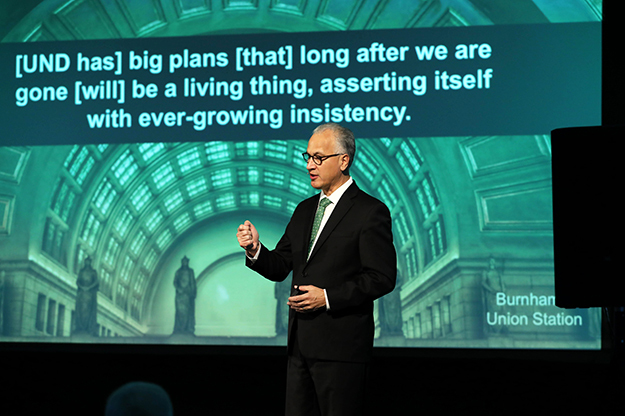 UND President Mark Kennedy made his annual “Wake Up to UND” address to community and business leaders on Tuesday, Sept. 25. There, he stressed that the One UND Strategic Plan will not only support the University, but the wider community through its advancement. Photo by Jackie Lorentz/UND Today. 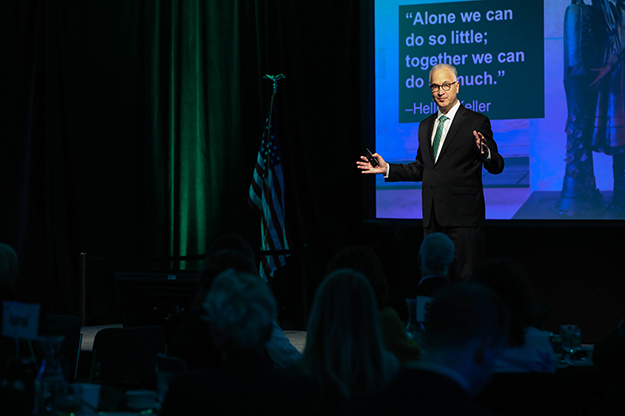 UND has big plans for the future that will help Grand Forks, the region, state and world, said President Mark Kennedy at the Wake Up to UND Breakfast on Sept. 25. The annual event, sponsored by The Chamber of Grand Forks and East Grand Forks, updates community and business leaders on UND and its initiatives. “The business community strongly supports UND and its Leaders in Action,” said Ron Galstad, chair of The Chamber, as he introduced President Kennedy. Kennedy noted that one percentage point of each year’s tuition rate increase has been dedicated to improving the campus, and said increased investment in marketing and research seed funding will help UND grow. Higher education is competitive, Kennedy said, citing demographic factors which indicate that universities will compete for fewer students. The number of colleges able to issue federal educational aid has shrunk by 650 in the last few years. 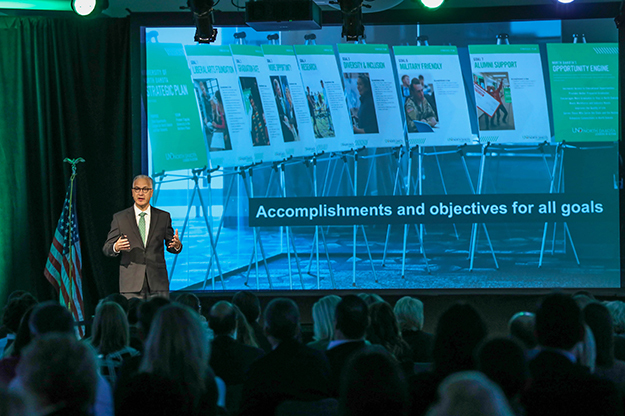 President Kennedy focused on progress made in UND’s Strategic Plan, including enhanced experiences for students, improving teaching, removing barriers and helping students graduate, enhanced advising, and boosting enrollment. Photo by Jackie Lorentz/UND Today. “We intend to thrive, not just survive,” Kennedy said, adding that the University needs to be more nimble to do that. 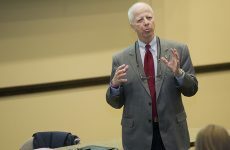 He said UND is supporting the State Board of Higher Education budget requests for flat funding and merit pools to recruit and retain faculty and staff, as well as requesting more flexibility to address needs. 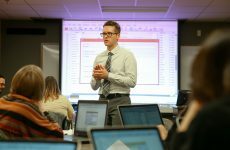 Kennedy focused on progress implementing the One UND Strategic Plan, including enhanced experiences for students, improving teaching, removing barriers and helping students graduate, enhanced advising including a new degree planning tool, and boosting enrollment. “We are committed to shaping our future,” he said. 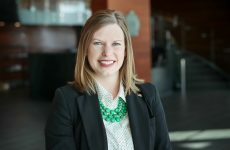 UND’s new web site has generated five times as many inquiries from prospective students, Kennedy said, adding UND is also planning to improve the application and tracking processes. He noted the Odegard School of Aerospace Sciences 50th anniversary, and thanked donors Hal and Kathy Gershman for funding the remodel of the J. Lloyd Stone House for graduate and international students. 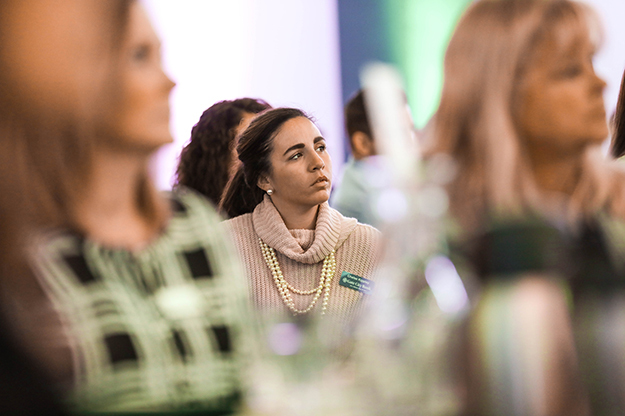 Chelse Kippley, with Gate City Bank, listens intently to President Kennedy’s “Wake Up to UND” address held Wednesday in the UND Memorial Union Ballroom. Photo by Jackie Lorentz/UND Today. UND must invest in online courses, Kennedy said. With increased demand for bachelor’s degrees, online offerings can help people in the workforce complete a degree or earn a graduate degree that enhances their career prospects. “There is a lot of competition,” Kennedy said. “Five percent of universities provide half of online degrees. We are the biggest in eight states. We need to go big or go home.” He added that about a quarter of UND’s credit hours are online credits. “We don’t want to be displaced by out-of-state universities,” Kennedy said, noting that UND is strengthening online and on campus offerings and ensuring they are of equal quality. The University is working with Pearson Learning Systems to improve marketing and the online experience for some online programs. Investment in UND and NDSU research could spark economic impact, Kennedy said. He and NDSU President Dean Bresciani are advocating for a $100 million investment in university research that could lead to more money from the federal government, corporations, increase the workforce in high need areas, increase patents and startups, and diversify the state’s economy. By focusing on campus master planning, UND is making its campus more attractive to students, said President Kennedy. Photo by Jackie Lorentz/UND Today. Students decide whether to attend a university within the first seven minutes, Kennedy said. UND’s master plan to upgrade space will make the campus more attractive, and the removal of dated buildings has helped address deferred maintenance. Now, the focus will be on renewing campus. Replacement of the Steam Plant, upgraded parking lots, the remodel of the Stone House, a library renovation, and streetscaping University Ave. are in the works. Proposed projects include a new College of Business & Public Administration building, the second phase of the High Performance Center and a new STEM building. “We are focused on building the future,” Kennedy said, thanking legislators and area leaders for their support. He capped off the event by presenting the Presidential Medal to Dave Molmen, Altru CEO, for his work partnering with the School of Medicine & Health Sciences to support medical training. “It is partnerships like this which have made us great,” Kennedy said.